On the 1st of every month I will release a new DIY pattern and PDF package jam packed with information and insider tips on how you can create your own beautiful piece of contemporary embroidery. Each pattern will be limited to the month in which it’s released, so if you see something you like don’t miss it! In line with my own work, I have focused this pattern collection around popular contemporary subject matter such as minerals, cacti and houseplants, wild flowers, lunar phases, and minimalist seascapes. To add to the fun, the exact subject matter for each month will be kept a secret until it’s released. You can rest assured that each project will emphasise all the characteristics you’ve come to associate with my work. So, get out your needles and sharpen your scissors, it's time to sew! © 2016 Sarah K. Benning. All Rights Reserved. Under no circumstances should the content of this pattern be reproduced, replicated or commercially distributed. This pattern is designed for PERSONAL USE ONLY and the pattern files (digital and/or printed) should not be sold or gifted without prior consent from Sarah K. Benning. Violations of these terms could result in legal action, the termination of your subscription, and the immediate removal of offending content. My Etsy shop is dedicated to my SKB DIY Pattern Program! On the 1st of every month I will release a new DIY pattern and PDF package jam packed with information and insider tips on how you can create your own beautiful piece of contemporary embroidery. Each pattern will be limited to the month in which it’s released, so if you see something you like don’t miss it! In line with my own work, I have focused this pattern collection around popular contemporary subject matter such as minerals, cacti and houseplants, wild flowers, lunar phases, and minimalist seascapes and cityscapes. I offer single month and 3-month subscription options. As a 3-month subscriber you would receive patterns at a discount and in a variety of those design categories. To add to the fun, the exact subject matter for each month will be kept a secret until it’s released. You can rest assured that each project will emphasise fresh, contemporary design and all the characteristics you’ve come to associate with my work. Davey is my husband and business partner and tackles most pf the customer service responsibilities around here, leaving me free to focus on the development + production of new patterns! Please carefully read these policies before placing orders and feel free to send me a message with any questions. 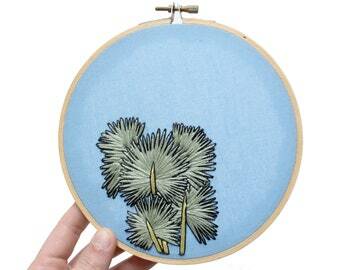 On the 1st of every month a new DIY embroidery design will be released as a PDF instant download. Each pattern will be limited to the month in which it's released, so if you see something you like, don't wait until it's too late! All downloads will include an embroidery pattern, a suggested material list, a basic illustrated stitch glossary, and step-by-step instructions to complete the project. These monthly patterns are designed to be used by all skill levels, from embroidery beginners to seasoned stitchers and I do my best to anticipate your questions and provide pro-tips and practical solutions as a part of the package. However, please understand that some very basic previous knowledge or further independent investigation may be necessary. These patterns are a celebration of the making process and are meant to be fun! If you have any questions, you can always reach out via Etsy message or email to info [!at] sarahkbenning.com. Quarterly (March, June, September, December) I will release Advanced #SKBDIY Patterns. These projects are designed for those with previous embroidery experience and knowledge. All Content © 2016 Sarah K. Benning. All Rights Reserved. ALL SALES ARE FINAL and refunds will not be issued. Due to the nature of instant downloads refunds, cancellations, or exchanges are not possible. Please read all available information carefully before completing check out. I accept payments through Etsy's direct checkout and Easy gift cards. Payment must be made in full in order to receive goods. Because I of the nature of Instant Downloads, all sales are final. PLEASE MAKE SURE YOU HAVE THE CORRECT EMAIL ADDRESS ENTERED AT CHECKOUT. And if your email address changes in the middle of a multi-month subscription, please inform me immediately to continue receiving your patterns. Your email address will only be used to deliver your subscription files. If you wish to join my mailing list, please do so here: https://mailchi.mp/sarahkbenning/sarah-k-benning-newsletter (you will not be automatically added by making a purchase). I cannot be responsible for sending files to the wrong email address if my records match those from your purchase. If you think there has been a mistake, please get in touch immediately via email at info [!at] sarahkbenning.com. For the quickest response, use 'Address Correction' in the subject line. Without that subject line, it may take several weeks to receive a response potentially leading to a disruption of your subscription. I greatly appreciate all customer feedback. However, if for some reason you have had a negative experience, PLEASE get in touch with me first so that I can do my best to remedy the situation. I would love the opportunity to correct any issues that may arise before you leave public feedback. I love to see how your embroideries are turning out and I periodically share pieces from #skbdiy on my own @sarahkbenning Instagram feed. Please visit sarahkbenning.com/pattern-program for a full breakdown of my Pattern Programs and related FAQs. Your privacy is very important to me. Unless you opt-in to my mailing list (which you can do here: https://mailchi.mp/sarahkbenning/sarah-k-benning-newsletter ) you will only receive emails from me to fulfil your subscription order. These monthly file deliveries will cease when your subscription expires. However, I may also be required to retain this information to comply with my legal and regulatory obligations, to resolve disputes, and to enforce my agreements. The data included in your Etsy receipt may be retained for up to 4 years. As a US based business, I may store and process your information through third-party hosting services in the US and other jurisdictions. As a result, I may transfer your personal information to a jurisdiction with different data protection and government surveillance laws than your jurisdiction. If I am deemed to transfer information about you outside of the EU, I rely on Privacy Shield as the legal basis for the transfer, as Google Cloud is Privacy Shield certified. -Change, restrict, delete. You may also have rights to change, restrict my use of, or delete your personal information. Absent exceptional circumstances (like where I am required to store data for legal reasons) I will generally delete your personal information upon request. *Please note that a request to delete your personal information during the course of your subscription will terminate said subscription. All sales of digital products are final. Such a termination will not result in a refund. I only see DIY patterns here on Etsy, do you sell completed works too? Yes, I do! My Etsy shop is reserved for my #SKBDIY Pattern Programs only, but I sell completed works via my website: sarahkbenning.com. However, due to the slow nature of embroidery, website updates happen infrequently and new work tends to sell out very quickly. I always announce the date and time of my next shop update on Instgram (@sarahkbenning) and you can jump on my mailing list for an extra heads up. Once I get my download, can I make copies and share it with my friends? // Can I sell the things I make from your patterns? These patterns are designed for personal use only. That means that when you purchase and download a pattern you are the only authorized user and can create the project for yourself or gift the finished piece to friends or family. You are not authorized to distribute or share the pattern itself with anyone else. 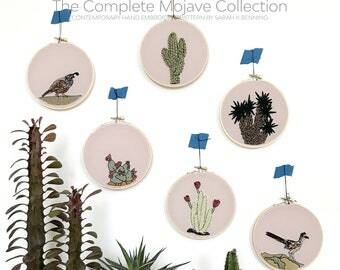 Nor are you authorized to sell any finished products made using my designs. Every design I make is protected by copyright. The unauthorized distribution of these materials hurts my ability pay my bills and could lead to the termination of this program. So please, be cool and don’t do it. How do I gift a pattern subscription to a friend or family? If you are purchasing a pattern subscription as a gift for a friend, please (please, please!) include that information and the recipient’s email address in the ‘Notes to Seller’ section at checkout. The first pattern will be available to you as an Instant Download directly through Etsy once your payment has been processed. It is your responsibility to retrieve and forward this initial download to your friend and all remaining patterns in the subscription will be emailed directly to the provided email address on the first of each subsequent month. My monthly patterns are designed for all skill levels from embroidery beginners to seasoned stitchers. These monthly designs will take approximately 3+ hours to complete depending on your skills and stitch speed. My advanced patterns are designed for those who have already participated in my monthly pattern program for a few months and feel confident about their stitching abilities or folks who have independent embroidery experience. Those purchasing the advanced pattern should already be familiar with embroidery techniques and materials and have their own preferred transfer methods in place (or at the very least, should be willing to do additional research and experimentation on their own). These project take 12+ hours to stitch. I want to buy a multi-month subscription, but what if I don't like an included pattern, can I exchange it for a different one? 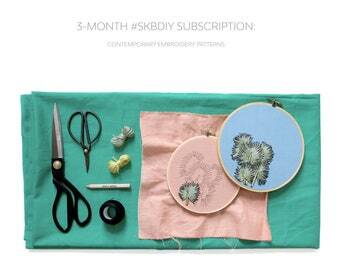 // I already have a multi-month subscription, can I replace one of my monthly patterns with an advanced design? I will only release one pattern for each month and it is not possible to exchange or request a different one. I am working very hard to create fun and interesting patterns every month, but I certainly can’t account for everyone’s taste. The subject matter of each new month will be a surprise and if you aren’t sure you will be interested in every design, then maybe buying individual patterns is the better choice for you. I bought a multi-month subscription, but now I've changed my mind and I don't want to complete the program. Can I cancel my order and get a refund? All Pattern Program purchases are final and refunds will not be issued. Please read all available information carefully before completing your purchase to make sure you are buying the right product for you. When are new designs available? // I missed out on last month's pattern, can I buy it now? A new design for my monthly Pattern Subscription Program is always available on the first of each month. These patterns are only available during the month in which they are released. Advanced patterns are available less regularly. I will do my very best to release new advanced designs every three months, however this schedule is subject to change without notice. Because of this slightly more flexible release schedule, advanced patterns will not be available in a multi-month/multi-pattern subscription model. However, the availability of advanced patterns will still be limited to month-long stretches. Do you take custom orders? // Are your products available for wholesale? // Do you offer workshops or could I use your designs to create my own workshops? Unfortunately, at this time, I am unable to take custom or wholesale orders. As stated, my patterns are designed for personal use only and may not, in any way, be used commercially. 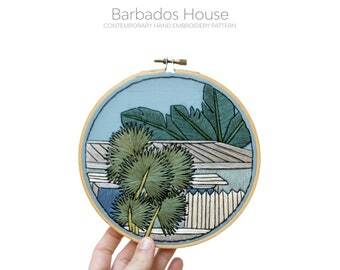 This includes, but is not limited to, using my designs to conduct your own embroidery workshops. If you have a space and would be interested in hosting a workshop with me, please contact me at info@sarahkbenning.com.